If you have been a student in Ontario, in grades 3 – 12 you have been taught The Writing Process. It is an organized fashion of discussing writing. Although writing is not always done in a linear manner – chronologically – because sometimes steps are revisited in rereading the material – it is easiest to discuss it as a process. 1. Gather your ideas – There are several approaches you can use: brainstorming is jotting down words and phrases. Branching is writing key words and ideas that flow from them. Listing would include categories and lists of organized ideas. Webs include a central idea and tangential ideas that flow from it. Mind mapping is similar. That is a central idea is placed on the page with key words and pictures and codes flowing from it as from the centre of a wheel – outwards in more and more precise detail. 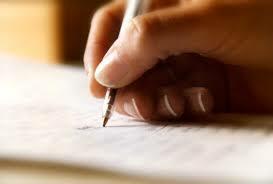 Free writing is a method of writing whatever you are thinking until the ideas begin to cover your topic. This is particularly a good method to overcome writer’s block. Just write and keep writing until you get some main points you want to cover in your assignment. 2. Formulate a Thesis or Purpose Statement- Put into one sentence the main idea of your paper. You can change the wording later. It is important to state what it is you will cover in your paper. This deals with the scope of the document – how much will you cover? In an essay, it usually names your main points. In a report, it either includes your main points or they are listed in the next sentence. 3. Research – If you are a college or university student, you are assigned research papers. You are to integrate your research, the knowledge of experts, into your paper. Gather quotes and key ideas from a minimum of 3-5 sources for a short paper. It would be wise to copy the Bibliographical information so that you can produce a Works Cited (MLA style) or Reference(APA style) bibliography later. 4. Evaluate your quotes and citations – decide what you want to use and what you will save for another paper or reference. There is no specific rule about how much to quote or cite – but generally you should have a quote or citation to validate your proofs. In text citations are frequently used and it is an easy way of giving credit to your sources. Only give a direct quotation when the sentence itself is worded in such a way that you believe it is essential to your content and cannot be said in a briefer way. 5. Write your Draft – I would recommend that you begin with the body of the paper first (others may differ). Once you have determined your main points, cluster them into paragraphs and weave quotes and citations throughout as proofs for your ideas. Do NOT just give a list of quotes and citations. Always comment on the content in light of your thesis or purpose statement. There should be no ideas that do not connect to your thesis or purpose statement. 6. Let it sit – After you have finished your draft, so do something else. Let it sit. The experts recommend 3 days. I understand that for most college and university students this is a rare luxury. I would recommend you give it at least 1 hour. Go do something fun and totally different. When you come back to re-read it, you will see it with fresh eyes and be more likely to catch errors. 7. Compose the Introduction and the Conclusion – The introduction should include the context for the writing piece – the audience and scope of the document as well as the thesis or purpose statement. It is generally about 1/5 of the length of the document. The conclusion should summarize the main points and possibly make recommendations if that is asked of you (document specific). 8. Revising and Editing – Reread the document looking for errors in style (sentence flow and meaning) as well as grammar, punctuation, spelling etc.) The experts recommend that rather than try it catch it all at once, you do a series of sweeps. That is, you read it once for content. You read it a second time for grammar and punctuation etc. I would highly recommend, you compile a list of errors you commonly make and proof read for those things specifically. Make changes throughout the document as needed. You may reorganize paragraphs or sentences or just change words. 9. Get a proof reader – Get someone who will give you honest but helpful feedback. You want someone who will read the question asked of you and will read your thesis or purpose statement to be sure you have answered it. 10. Final Revisions – Proof read the document once more and then make what should be only minor revisions. Finally, hand in the document. Always keep a file for yourself. It is the start of another semester at most Universities and Colleges. New opportunities to learn and to show what you have learned through papers and exams will be given to you. It is only the second week of class but already you are forming habits. You are making decisions about whether or not you will do your readings. You are making decisions about whether or not to attend class and if you do attend, whether or not you will pay attention and be open to learning. 1. ATTITUDE FOR SUCCESS – Attitude is an indicator of ability. It doesn’t have to be. That is because you yourself decide what you will feel and how you will approach the day and its events, but poor attitude towards studies will cripple you so that you are unable to learn. YOU CAN DO IT. You alone decide what you will accomplish. Are you going to study? Are you going to attend class? Are you going to learn all you can from the teacher so that you can have the skills needed for your career? In writing, as in other subjects, your willingness to take the instruction and review it will impact your ability to learn. Doing the readings and attending the class will certainly help you, but reviewing your notes will make you the master of the material. Is your attitude set positively? I can do anything? It is really the truth – you can do anything you want to do and apply yourself to do. 3. GO TO CLASS! – Attending class lectures and LABS if they are a part of the class will assure that you complete assignments on or before their due dates. Skipping out will lead to falling behind. Take notes. If your teacher is writing on the board – you should be writing in your notebook or typing on your laptop. Most likely the teacher has posted the notes to Blackboard or CLEW or whatever Educational Assistant Communication host your school offers. You should take notes anyway. Do you know the more ways you take information in – the more likely you are to remember it? 4. QUESTIONS? Is there some part of the information you didn’t understand but were afraid to ask for help with in front of others? Jot the question down and speak with your professor either privately after class or during his/her office hours. You should try to gain the confidence to ask your question – if you have that question – probably others do also. If there isn’t time in class, the teacher will speak with you outside of class. 5. REWARD YOURSELF – You will probably like this part best. Give yourself a reward that you set for completing your tasks. You studied or read your chapters – give yourself a reward. It could be whatever you believe is valuable.